There is a lot of current information available about addiction and the brain. I was thinking about this today as I read an article in the Indiana Gazette about adolescent addiction and how it affects the adolescent brain. As I was thinking about the post I wanted to write about that article, I realized that before I could write that post, I had to write this post about the process in the brain. So look for that adolescent post next week. a disorder of structure or function in a human, animal, or plant, especially one that produces specific signs or symptoms or that affects a specific location and is not simply a direct result of physical injury. Addiction also is comparable to other diseases in that it has a distinct possibility for lack of self care and relapse. Finally, like any other disease, addiction has a significant impact not just the individual, but on the family as well (more about that in another post). So we have established that addiction is a brain disease. What does that mean? The picture above gives an idea of the progression we are discussing. Substance use may progress to substance abuse which may progress to addiction. Once an individual reaches the addiction stage, it begins to change the structure and function of the brain. Since the brain is one big communication center: it sends, receives, and processes information all day long. The good, the bad, the happy, and the sad all processed and communicated by the brain. 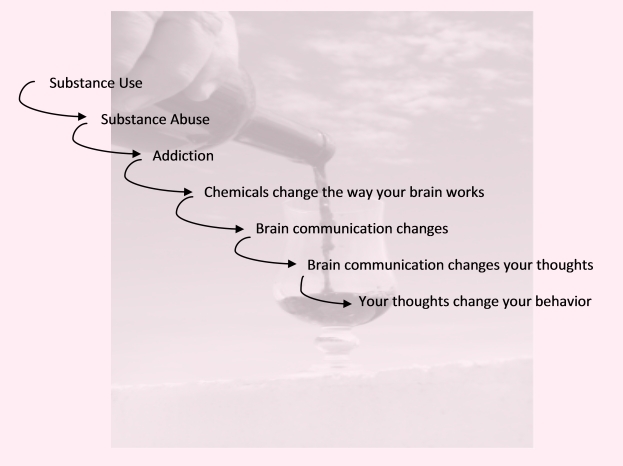 As individuals progress into addiction, the substance begins to interfere with the way the brain communicates its messages. The reward center of the brain becomes a target. Instead of its regular normal communication, the reward center is either faked out with imposter communication, or flooded with 2-10x the normal amount of dopamine (the happy chemical). Further problems occur when the brain starts to compensates for the faking and flooding by under-producing dopamine naturally. The underproduction causes an individual the inability to feel a normal amount of pleasure from casual everyday events. The faking and flooding to the brain’s reward center produces the euphoric effects that people enjoy. The thinking becomes “wow that was fabulous I need to do that again” encouraging individuals to seek out the chemicals and repeat the behavior that caused the euphoria. Eventually, the underproduction of dopamine causes someone to feel lower than they might normally, and they begin to seek out the “high” to feel “normal”. Thus we see how the harmful and often destructive thought|behavior patterns begin to emerge. Treating addiction as the brain disease that it is requires a shift in thinking on the part of many. Society, treatment providers, and individuals all must acknowledge the brain changes, continue to work to eliminate the stigma, and change the language associated with the disease of addiction. Just as with any other disease, it does not mean that the individual does not have to take responsibility for their thoughts and behaviors, it does mean that we are changing how we view them as they do so. A 60 Minutes segment with Dr. Nora Volkow, head of the National Institute on Drug Abuse, discusses addiction as a disease. The Addiction Project produced by HBO includes text and video on many topics surrounding addiction.